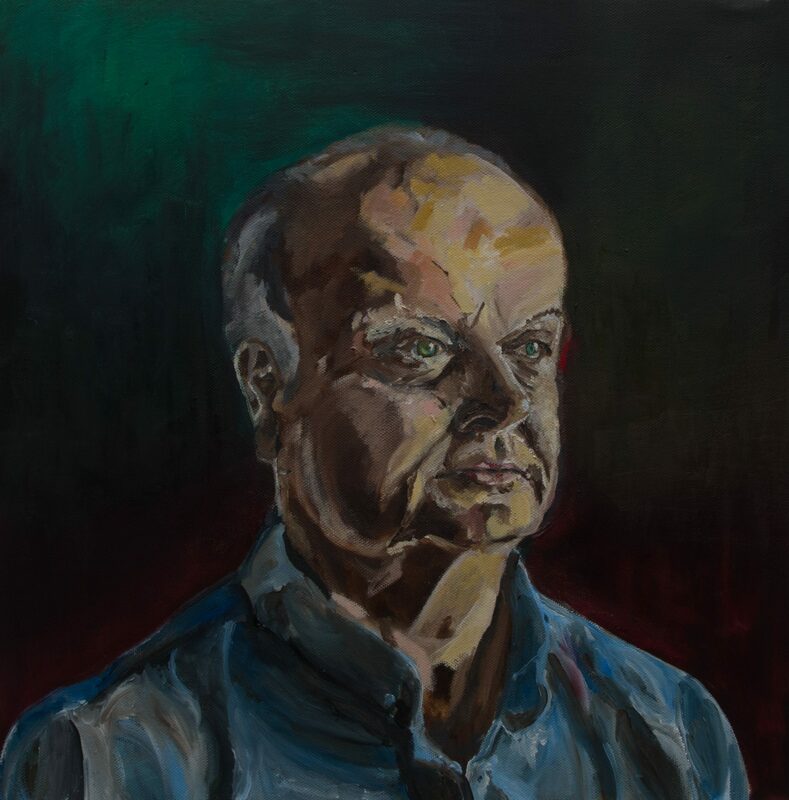 This month’s featured work is “Portrait of my father, Richard Faulkner” and unsurprisingly this is a very personal work of art. I’m fairly new to portraiture and when starting out I discovered that this presented me with a number of challenges. Firstly, the availability of faces and those willing to sit can be limited from the awkwardness of asking “Hi there, do you mind if I paint your face” to the logistical challenges of asking someone to sit and pose for a prolonged period of time without inducing laughter or again further awkwardness or the standard “I’m not ready for this, my face looks horrendous”. The necessity to practice however became essential to me and the opportunity arose when my Dad was visiting me in Dundee I simply said to him “Dad, I need to borrow your face” and he willingly obliged without question! Portrait of my Father, Richard Faulkner. 2017. There were moments, evident in these photos of the process where the face simply isn’t there. Dad went through an alien phase, an anaemic phase, a giant head phase. A more skilled artist would have been able to identify and rectify these mistakes earlier however every mistake I made seemed to taunt me with every brush stroke. A likeness, I discovered is earned. The “eyes are the gateway to the soul” – yes the eyes are important and certainly a hugely defining hallmark that creates the likeness but I think they have been given too much importance. I would argue that the nose is the most important anatomical landmark when painting a face. Paint it wrong and the eyes can be as beautiful and accurate as you like but it won’t look like the person. I found as soon as I nailed the nose, the rest followed suit. The nose anchors everything around it, from the distance between the eyes to the distance between the lips, and chin. The nose is the centre in which all rests upon and the moment I got that right it was like eureka – Dad is there! I have a newfound respect for the amazing nose. It’s something I really try and rectify early in future portraits. So when working on this portrait I would reach a point of exasperation and basically put everything down and just walked away. I’d make a cup of tea, watch an episode of Game of Thrones come back and the face I wanted to achieve is staring at me. Stepping back, and not looking was integral to the process as painting. I’m a passionate photographer and in the past I have created portraits with photos. What I discovered in painting however is a greater reward once the portrait is finished. Every line, brushstroke, mark or tone is as a result of a labour of study, scrutiny and effort. I revisit this portrait and I see my father but I don’t just see his face. I remember the labour involved in painting the nose, the mixing of the colours to create his eyes. The brush marks to create the forehead and ears. I joked that at several points he needed a facial reconstruction on multiple occasions due to my previous errors. The phases of Dad from giant-forehead phase, to sickly, to alien! What did I want to portray in this? 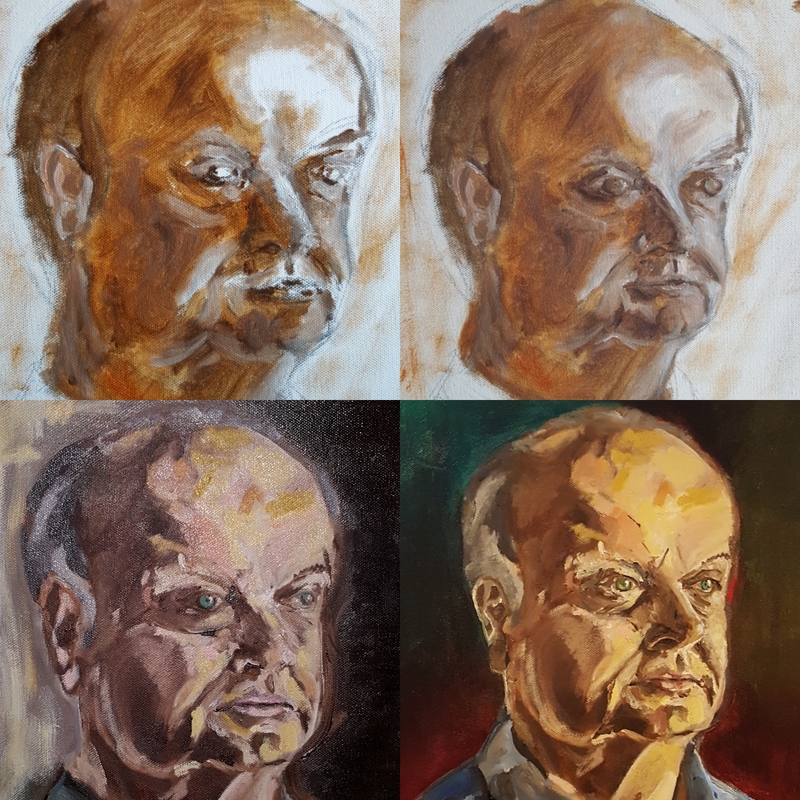 My principle aim was to create a likeness that my Dad would be happy with and that I would be happy to look at. I selfishly wanted this portrait for myself for my own collection. I reached a point where I thought I needed to do more but my flat mate at the time told me to stop. I stopped and I walked away. I then looked at it again and I was happy. I wanted to convey a sense of stoicism and dignity in the expression with a strength that is palpable yet silent but is there simmering on the surface. The background consists of colours representing each member of our family: red for my mother, dark green for me and a black and yellow tinge for my brother. The small fleck of red by his anatomical left eye signifies that he is always thinking and looking out for my mother. This is a deeply personal painting for me, one that taught me a lot about the process of portrait painting, the challenges that can ensue and the immense satisfaction at creating that likeness. All it needs now is a decent frame and prominent place to hang it!